The Bedford Performers is an organisation formed of Piano Teacher and Nailsea Music Shop owner, Carol Bedford and her dance teacher daughter Michelle. As well as teaching all age groups piano and dance, we periodically stage shows that enable our pupils to exercise their new skills in front of an audience. The shows are usually a blend of dance and musical performances, in many cases the performers taking part in both. It is our aim to donate any profit from these shows to locally based charities. So far we have been successful in doing this, as can be seen from the Past Show links at the left. If you would like more information about Michelle's dance classes go to Jazz On Tap or contact direct on jazzontap@hotmail.co.uk. If you would like more information about Carol's piano lessons, or lessons on other instruments, go to the Nailsea Music Shop web site or pop into the shop in Nailsea High Street. We always need help with promotion for the shows, construction of the scenery or props and assisting backstage during the performances. Don't be put off if you have no experience, we can always point a willing pair of hands in the right direction. You never know you might get hooked! If you are interested get in touch with Carol at the Nailsea Music Shop or drop her an e-mail at sales@all-music.co.uk. 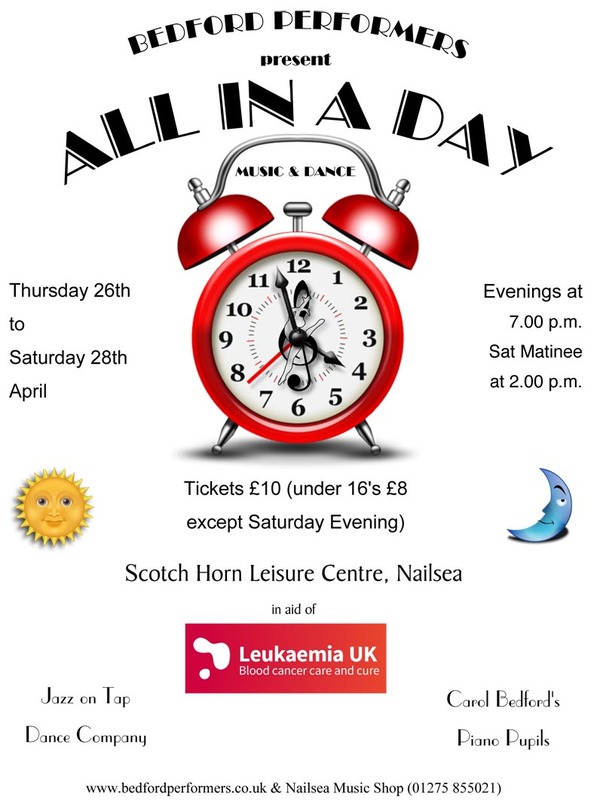 Our next show is ALL IN A DAY which will run from Wednesday 25th April to Saturday 28th April. Tickets will be on sale from here and at Nailsea Music Shop.